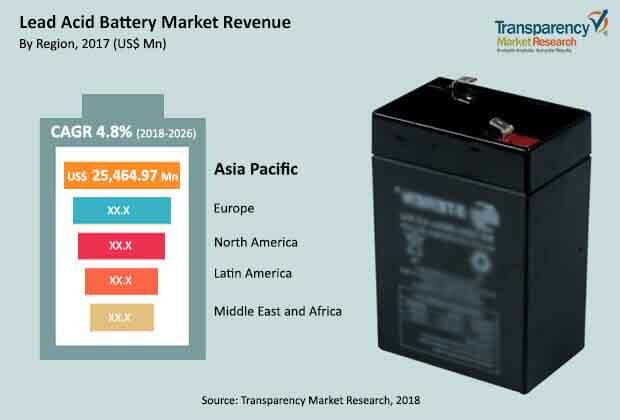 The global lead acid battery market is projected to expand at a CAGR of 4.0% during the forecast period 2018 to 2026, according to a new research report titled “Lead Acid Battery Market – Global Industry Analysis, Size, Share, Growth, Trends, and Forecast, 2017–2025” by Transparency Market Research (TMR). According to the report, the global lead acid battery market volume is expected to surpass around seven lakh thousand units by 2026. Growth of the global lead acid battery market is driven by the extensive usage of lead acid batteries in passenger car applications due to its low cost combined with reliability of performance. The lead acid battery market in Asia Pacific is estimated to expand at a CAGR of more than 4.9% during the forecast period owing to the presence of a large manufacturing & recycling base, favorable government regulations, development in automotive and industrial sectors, and increase in focus on research and development activities. Globally, 85% of lead is primarily utilized in batteries for passenger cars, trucks, motorcycles, uninterruptible power supplies, and solar power storage. Demand for passenger vehicles has increased considerably and is anticipated to rise further in the near future. This, in turn, is creating high demand for lead acid batteries. Automobile and manufacturing sectors are witnessing significant expansion. This is driving the demand for stationary batteries for power backup and that for deep-cycle batteries for wheeled mobility such as golf cars, wheelchairs, and scissor lifts. However, improper and illegal disposal of lead acid batteries causes environmental pollution due to its high lead content. Furthermore, demand for the alternative Li-ion batteries in the automobile sector is increasing due to the poor performance and low cycle life based on temperature of lead acid batteries are restricts the market growth. Manufacturing process advancements in recycling of lead acid batteries provide opportunities to lower the adverse impact on the environment. Based on product type, the lead acid battery market has been bifurcated into flooded and sealed. The sealed segment has been further sub-segmented into AGM and Gel. Flooded lead acid batteries are commonly utilized batteries. They are widely employed in the automotive sector. They have the least cost per ampere hour vis-à-vis other lead acid batteries. Sealed lead acid batteries are commonly known as Valve Regulated Lead Acid (VRLA) batteries. The number of plates and their thickness determine their end-use/application. The absorbed glass matt process is used in AGM lead acid batteries, wherein highly porous and fine microfiber glass separators . The automobile and UPS & telecom applications together account for more than 55% share of the market for flooded type batteries. Thus, these are the major segments in terms of product type. The flooded segment is anticipated to constitute key share of the market in the near future due to the extensive utilization in driverless transport vehicles, electric forklifts, and electric bicycles. Based on application, the lead acid battery market has been segregated into automotive, motorcycles, motive power, renewable, UPS & telecom, and others. The automotive segment holds the major share of the lead acid battery market. It is followed by the motorcycle segment. This trend is likely to continue throughout the forecast period. Lead acid batteries are primarily employed in automotive and motorcycles segment for starting, lighting, and ignition purposes. Renewable application is the one of the recent developing markets for stationary lead acid batteries to employ in off-grid renewable energy generation. Various key countries are focusing on renewable power generation. This is expected to augment the size of the lead acid battery market. Geographically, the global lead acid battery market has been split into North America, Europe, Asia Pacific, Latin America, and Middle East & Africa. Asia Pacific is anticipated to hold prominent share of the market owing to the fast-growing construction industry in countries such as China, India, Japan, South Korea, and Malaysia. This is boosting the usage of lead acid batteries in UPS applications due to its low cost and performance reliability. The increasing population leading to increasing use of vehicles and favorable government policies for lead recycling in the hands of private-public partnerships is anticipated to fuel the demand for lead acid batteries in the region. Europe is a key region of the lead acid battery market due to the ongoing developments, research and investments for off-shore in on-shore renewable energy generation activities and installations in Germany, U.K. and Italy. Key players covered in the report are EnerSys, EXIDE INDUSTRIES LTD., JOHNSON CONTROLS INTERNATIONAL PLC, GS Yuasa Corporation, etc. Other players include First National Battery, NorthStar, Amar Raja Batteries Ltd, HOPPECKE, Exide Technologies, HBL Power Systems Limited, C&D Technologies, Inc., East Penn Manufacturing Co., FIAMM Energy Technology S.p.A., Crown Battery Manufacturing Co., and Trojan Battery Company. Companies operating in the global market for lead acid batteries are focusing on market strategies to raise management performance overseas by integrating production facilities and manufacturing processes to address the major markets of lead acid batteries. For instance, Exide Technologies accounts for major share of the market in the U.S. and Europe. The company is targeting mid and downstream car manufacturers in Asia Pacific. GS Yuasa Corporation is a major Japan-based lead acid battery manufacturer, which is also concentrating on the overseas markets.